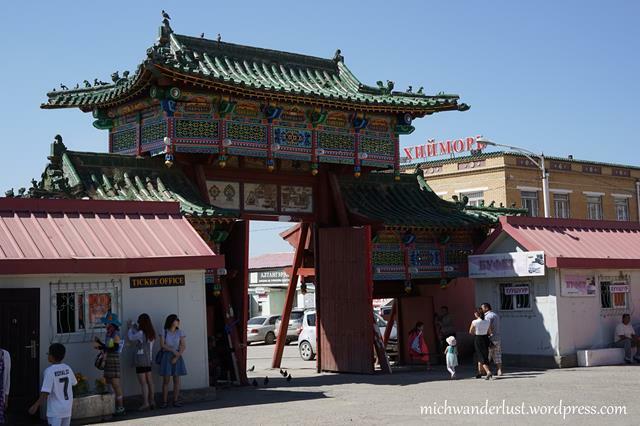 It isn’t on many travellers’ radar yet, but I loved my time in this still relatively undiscovered, untouristy part of the world. If you love going off the beaten track, this is for you. My primary motivation in going to Mongolia was to ride for days on end in the wilderness – and I got to do just that on a recent riding expedition in the Gorkhi-Terelj National Park with Stone Horse Mongolia, which also gave us 2 days in the capital of Ulaanbaatar (or UB as it’s nicknamed). 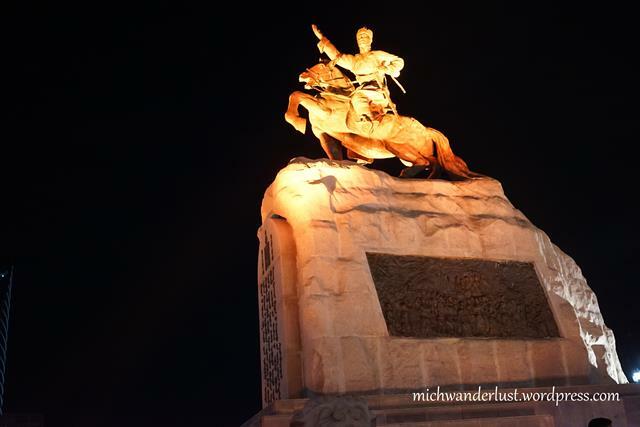 We extended our stay in UB by one day and were given a city tour by Davaa from Stone Horse. Separate post on Terelj to follow! 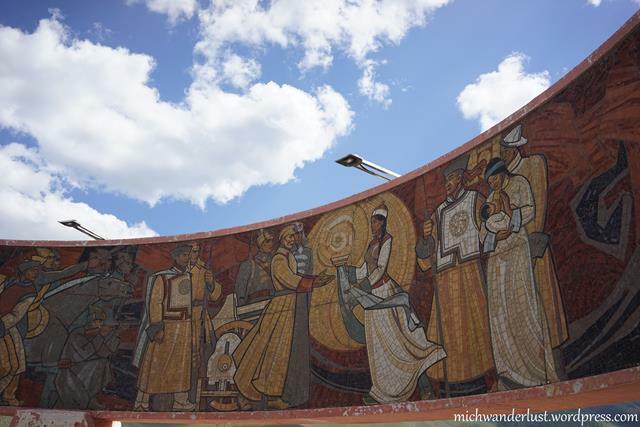 To be honest, UB isn’t the prettiest city in the world. It looks grey, there is a lot of construction going on as well as a fair number of abandoned construction projects, and crossing the road feels like a hazardous endeavour. UB drivers seem to always be in a rush and apparently interpret red traffic lights as “go if there are no oncoming vehicles, nevermind any pedestrians trying to cross”. You should cross the road at a constant speed (don’t run) and never assume that vehicles will stop just because of a red light. 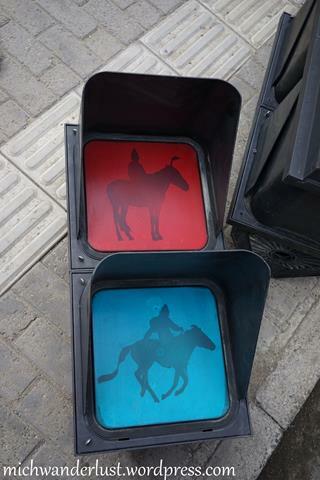 On the subject of traffic lights – aren’t these the most awesome pedestrian crossing lights ever? The tragedy is that these are apparently being phased out across the city and replaced with the usual kind – when we first stepped out of our hotel to wander around the city, there were a number of these in operation, but on our way back a few hours later they were all in the process of being removed or already removed (such as the one in the picture above). Why?? Also, as in most developing countries, the traffic jams can reportedly be crippling at times, although it is quite a compact city so we were able to walk practically everywhere we wanted to go and we were quite lucky in that we were only on the road during off-peak hours (our city tour was on a Sunday). 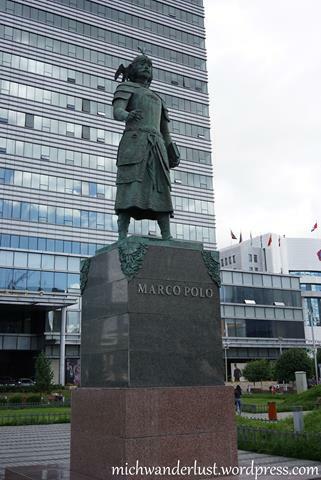 This statue near Chinggis Square seemed a bit random but I later found out that Marco Polo had actually stayed in Kublai Khan’s palace for a number of years. 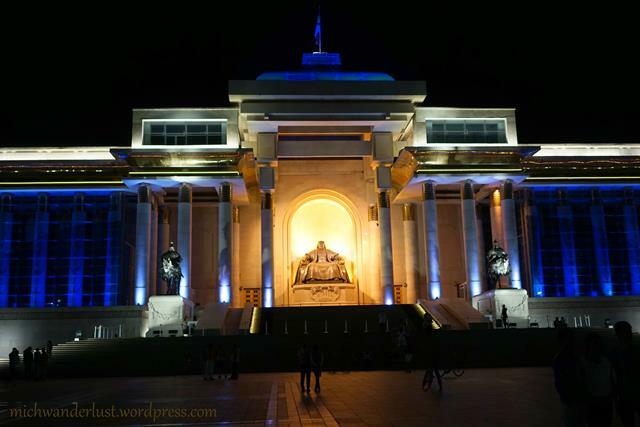 This square, sitting in front of the Government Palace in the city centre, is dominated by a statue of Sükhbaatar in the middle and a huge statue of Chinggis Khan at the north end. 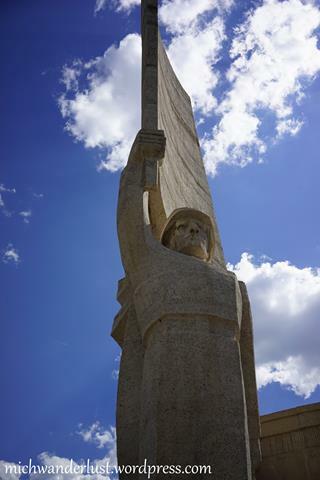 One of the leaders of the 1921 revolution which led to the founding in 1924 of the Mongolian People’s Republic (which was a Soviet satellite state until 1990). 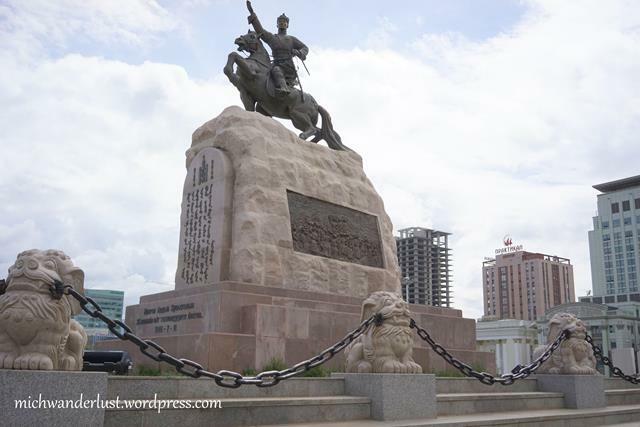 Did you know that Mongolia was such a young democracy? I liked the lions guarding the statue – as Davaa explained it, lions are placed in front of important monuments, temples etc. to scare away evil spirits. There is a similar concept in Chinese culture so it’s not uncommon to see stone lions in front of temples (and even houses) in Singapore. 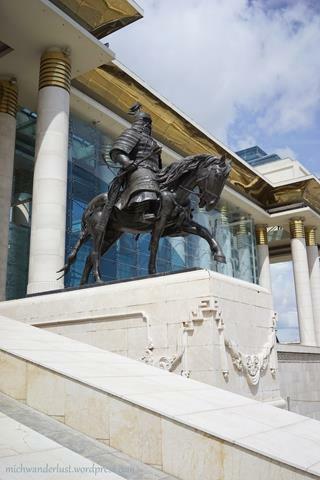 This is a huge statue of the legendary conqueror, but his image is practically everywhere in Mongolia – on the currency, on one of the first billboards you see as you leave the airport, and there’s an even bigger (40m tall) statue of him on horseback about 60km outside of UB. I’d like to know what the inscription says. 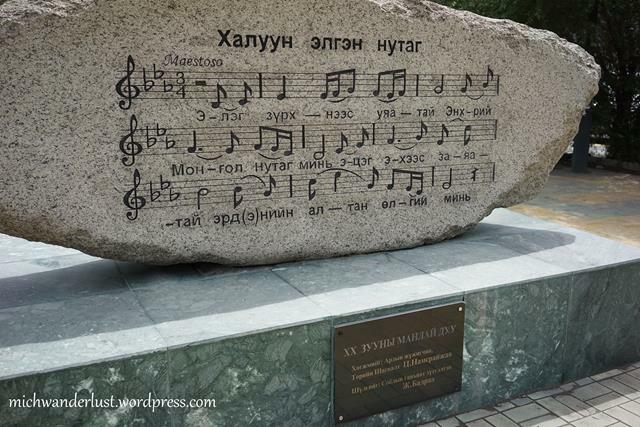 Inner Mongolia still uses this script, but Mongolians switched to Cyrillic more than 50 years ago so none of them can read the traditional script now except for some of the older people who can read a few words. It’s quite sad, but at least it isn’t totally lost. 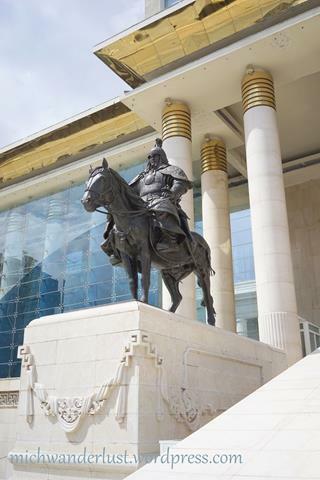 Two of Chinggis Khan’s generals guarding the entrance to the Government Palace. He is also flanked by two of his sons, but they’re not visible in this picture. “Gandan” Monastery for short, this was destroyed by the communists and was only restored after the democratic revolution in 1990. 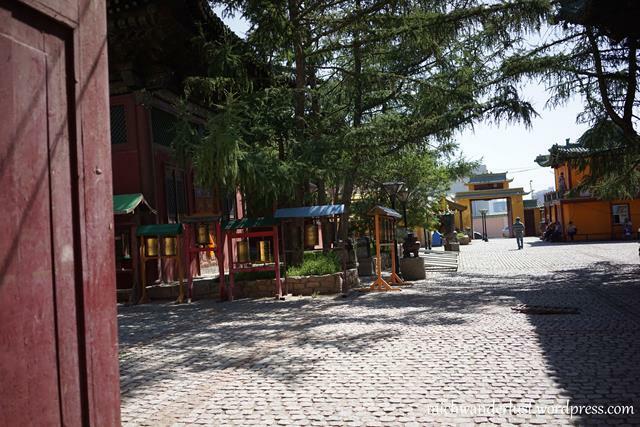 The entrance to the Gandan Complex, which is a complex within the larger Gandan Monstery complex. 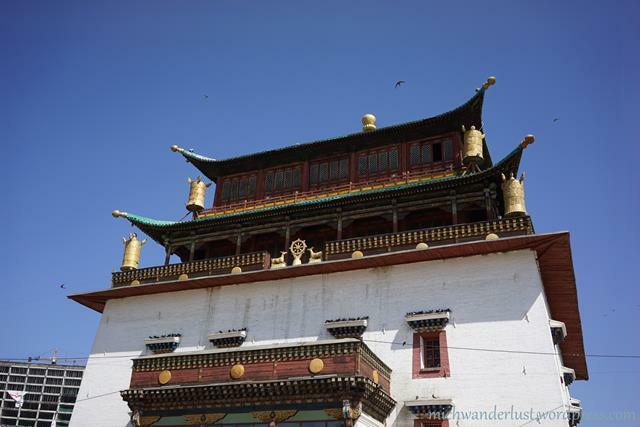 This houses the library (the yellow building on the right), and a few temples, one of which is the red one on the left. 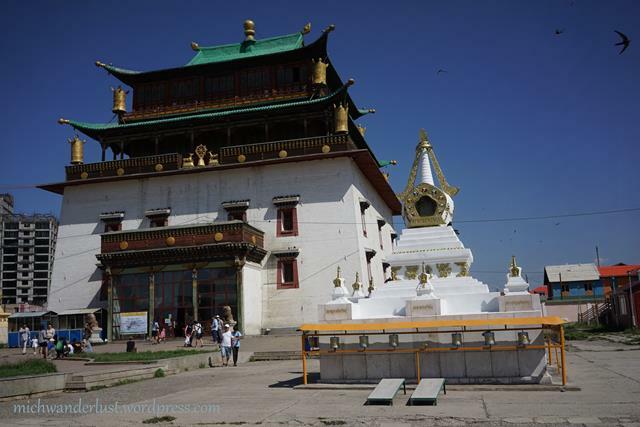 Mongolian Buddhism is very closely linked to Tibetan Buddhism so all the books and inscriptions are in Tibetan (which the monks have to learn) and there are certain features like the prayer wheels which seem to be unique to the Tibetan branch of Buddhism – I certainly haven’t seen them anywhere else! 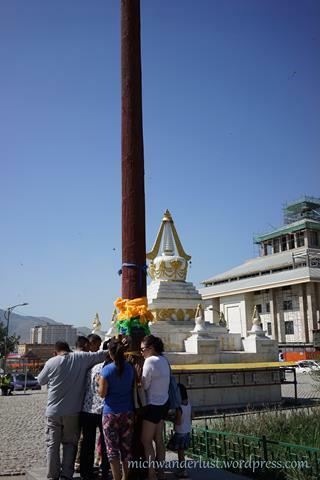 It was quite a sight to see people turning the prayer wheels and priests throwing rice as blessings. In order to take pictures inside this complex and the other temples you need to pay an additional fee on top of the admission fee (which we didn’t), so we don’t have any pictures from inside. It is definitely worth checking out though! 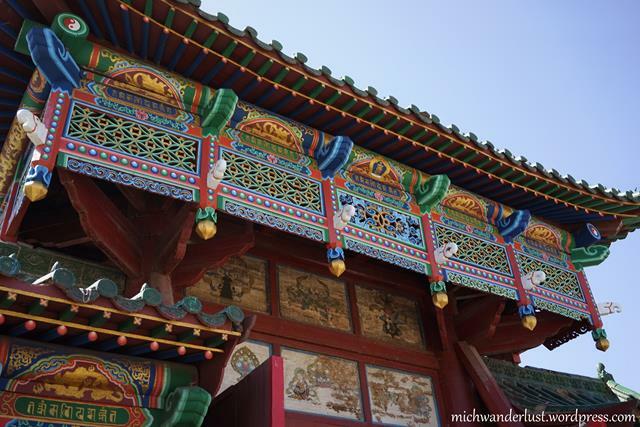 We were told that this wood is magical – people whisper wishes to it and walk around it two or three times for luck. 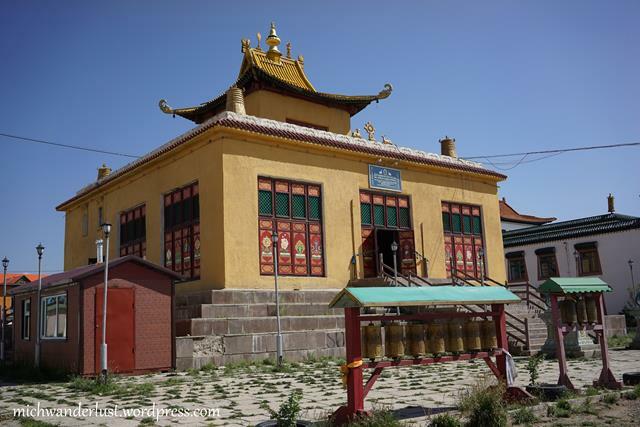 The white building on the left is the Janraisig Datsan – again, no photos inside (on hindsight maybe we should have just paid the additional fee!) but it was amazing. 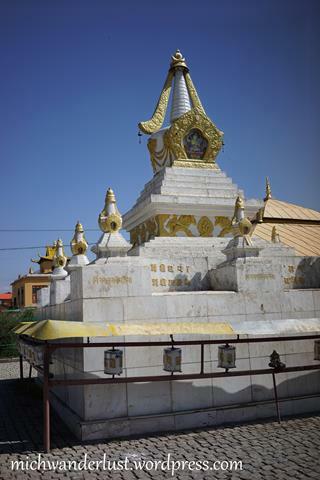 There is a massive Buddha statue inside surrounded by 1000 smaller Buddhas statues to protect it. 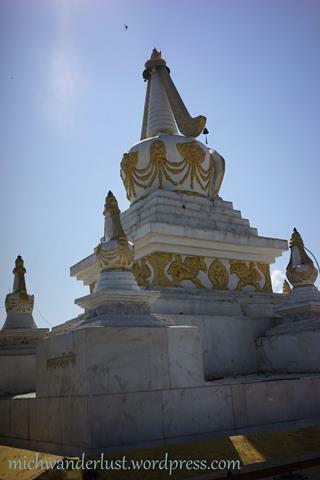 There are also smaller Buddhas in front of the massive one showing different faces of Buddha – e.g. there is one Buddha that people would pray to specifically for good luck with their studies. 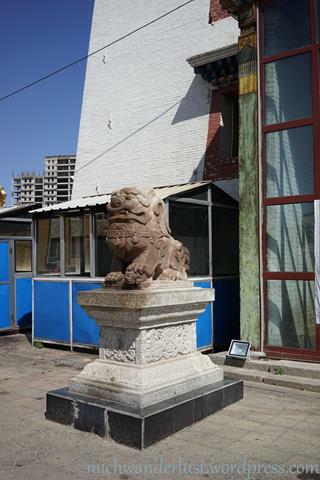 Yet another lion – this time in front of the Janraisig Datsan! Another Datsun with prayer wheels in front. 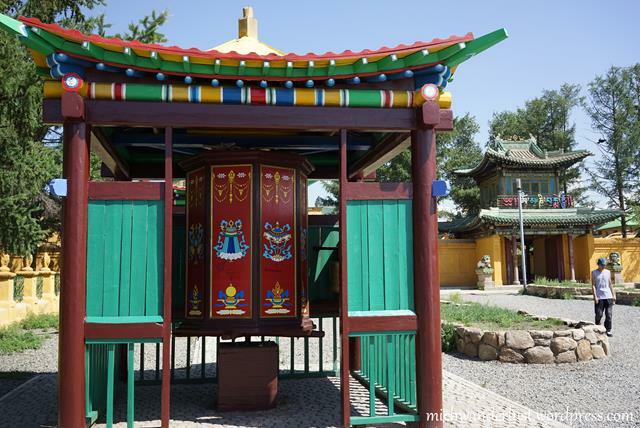 Massive and colourful prayer wheel. I highly recommend visiting this museum (again, no pictures inside because we didn’t pay the additional fee(!)) 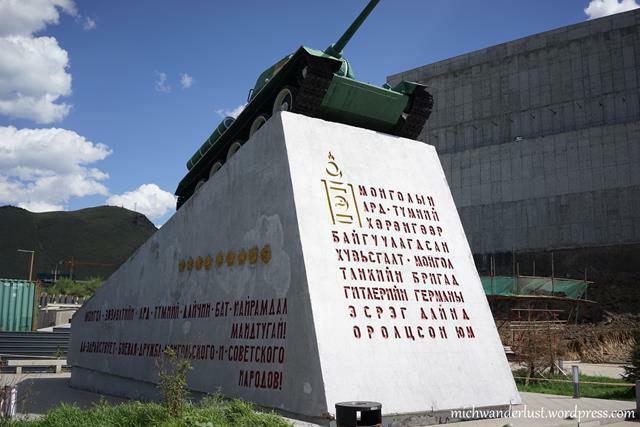 – it basically traces the history of Mongolia from prehistoric times (Stone Age, Bronze Age, etc.) 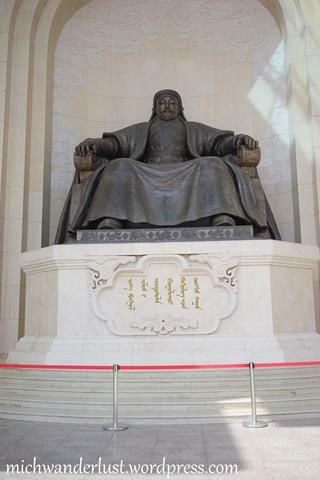 through the Mongol Empire of Chinggis Khan and his descendents down to the Soviet satellite days and modern day democracy. Very interesting stuff. 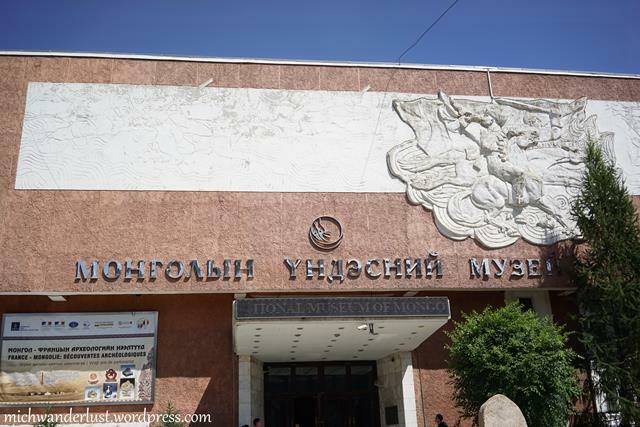 The Mongol Empire exhibit was the most interesting for me – it might be due to my world history not being up to scratch, but I was truly impressed at the size of the Mongol Empire. Of course, conquering countries and running them thereafter are two different things. I really enjoyed the tug banner exhibits – the white banners (made from white horse hair) were used during peacetime and the black banners (made from black horse hair) were for wartime. I wonder if there were many white/black-haired horses walking around with very short manes and tails in those days! One downside if you take the guided tour is that the guide moves through the exhibits really fast, so I was basically playing catch up most of the time as I like to read the exhibit descriptions, and ended up not catching a lot of what she said. After the tour ended we tried to go back to revisit the particularly interesting exhibits but apparently the flow of visitors is a strictly one-way street, so we had to exit and go back in from the front. At least we got to go back though! 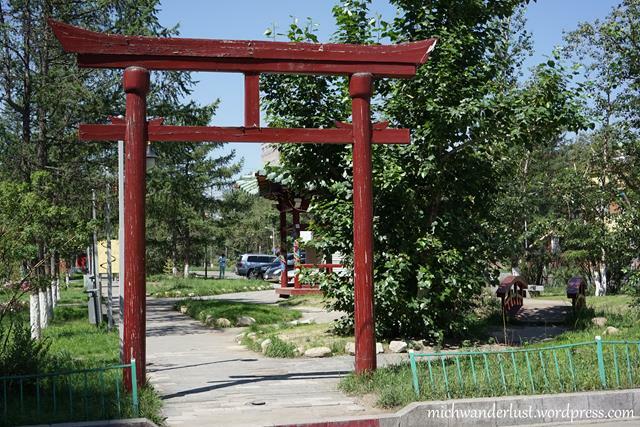 This looks just like a torii (the Japanese gate at shrine entrances) so it was really surprising to see this here in Mongolia! Especially since it was nowhere near a shrine or temple. 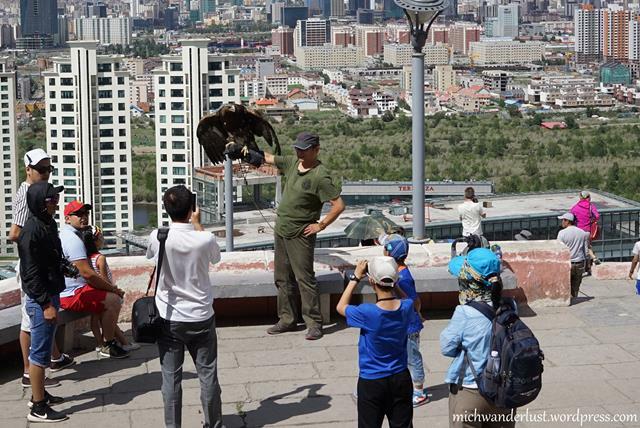 The view from the Zaisan Memorial is amazing, and is the reason we undertook this trek – you can see the whole of UB, but be aware that it’s 600+ steps to the top of the hill where the memorial is located. There seems to be a parking lot for coaches etc. about halfway up but we started from the bottom and it took us maybe 20 minutes to get to the top, including a breather about 1/3 up. I’m sure if you are fitter you would be able to reach the top with much less difficulty, but you might be slowed down if you happen to be stuck behind a big group of tourists/students clambering up (which is also what happened to us). 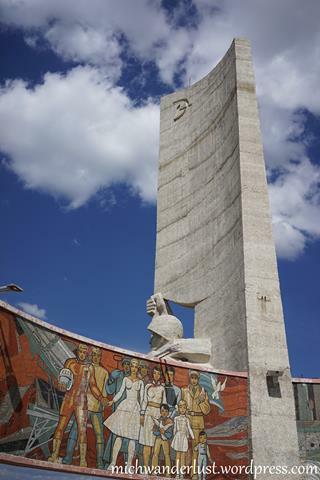 I’m not actually sure what this Soviet memorial depicts but according to Wikipedia these are scenes of friendship between the USSR and Mongolia. There was also a captive eagle with whom you could take pictures (for a fee, naturally). It would have been a great photo op but I couldn’t do it because I felt like I would be supporting captivity. 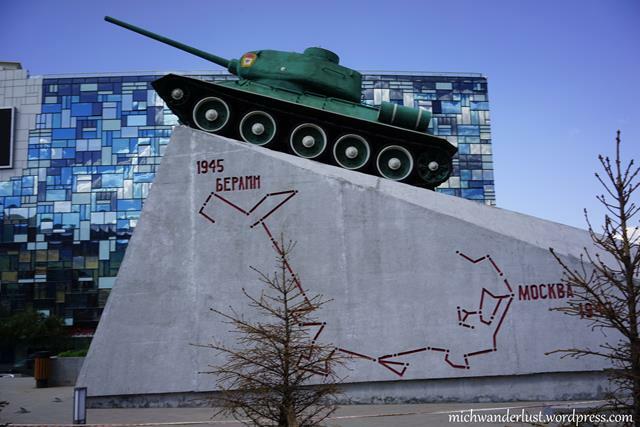 At the bottom of the Zaisan memorial is another memorial – this one is of a Soviet tank paid for by Mongolia, with a map showing the route the tank took from Moscow to Berlin in WWII. 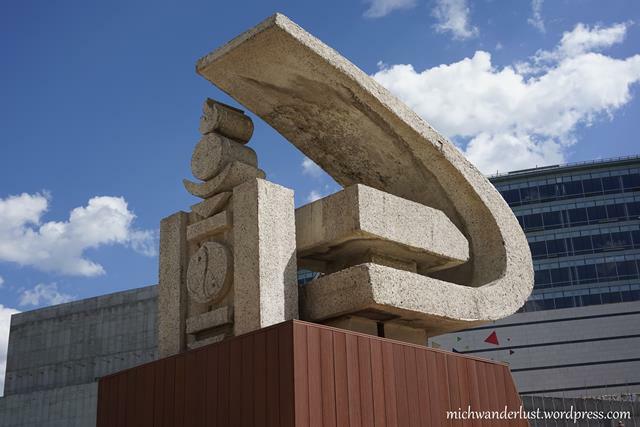 Nearby is the Soyombo symbol, which also appears on the national flag of Mongolia. I think it’s awesome that there is a yin and yang symbol right there in the middle! 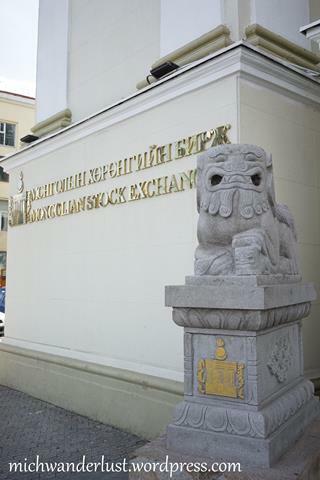 Behind it is the Communist hammer and sickle.